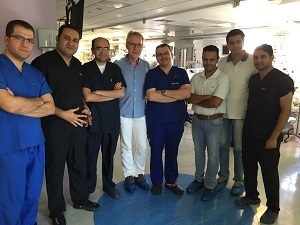 At the end of our October 2015 mission at Cairo Giza El Agouza Hospital we visited Aswan Heart Centre, in the South of Egypt, for the first time. The Aswan Heart Centre is an exceptional project launched in 2009 to establish a centre of excellence to combat heart disease in Egypt. A project of great significance to the Egyptian People, it places emphasis on establishing state-of-the-art facilities, resources, research and scientific methods to provide heart patients – especially to the underprivileged – with the highest standards of care available today. 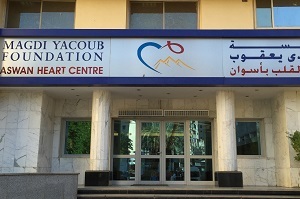 The AHC is an integral part of the Magdi Yacoub Foundation, one of Egypt’s most renowned charity organizations in Egypt. Professor Sir Magdi Yacoub, one of the most famous international cardiac surgeons, is also president from our British friends of Chain of Hope UK. 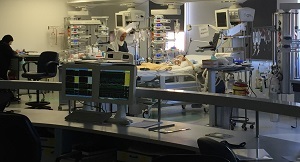 It was an honour and pleasure to have been invited to the paediatric cardiac intensive care unit. This unit and the whole centre belongs to best cardiac centres we have ever seen. And most of all, it is a real humanitarian project because everything is free of charge for the children of Egypt. Congratulations to the entire team of the Aswan Heart Centre, congarulations ti the Magdi Yacoub Foundation and congratulations to the peaople of Egypt for this great and blessed project.